PLEASE NOTE: As of the beginning of 2015, Channa informed me that she's no longer vegan. The below is an interview from when she was. Channa Serenity is a WBFF Bikini Pro and Spiritual & Holistic Health Practitioner. She’s dedicated her life to studying the healing arts and holds certificates in Iridology, Herbal Studies, Homeopathy, Bach Flower Remedies, Natural Remedies, Aromatherapy and Natural Nutrition & Symptomatology and as a Reiki Master. She is also a student of A Course in Miracles. Her passion is to help women take control of their bodies, minds and spirits, and create balance and harmony in all aspects of their lives. She wants to empower women and children to make lifestyle changes necessary for their best possible health. She is the founder of The Chakra Healing Cleanse. She is a featured writer for OM Times Magazine. Channa has authored the book 12 weeks to Raw-some, Diva edition and forthcoming children’s book, Isadora’s Journey. My love of animals first and foremost. I think it's cruel to consume animals. However, It was education that pushed me to go from vegetarian to vegan, I learned the healing properties of raw food and being a holistic health & energy practitioner I became overly sensitive to energies that were not my own. I feel AMAZING! I have much more clarity, vitality and focus, and no guilt. It means choosing a compassionate, cruelty-free lifestyle that also gives me years of enhanced vitality onto my life. I am a WBFF Pro Bikini Athlete. My training is always different to keep my body guessing, the program gets changed every 4 weeks. It’s a mixture of resistance, HIT and cardio. Yes I do, I offer complete wellness online programs, which includes a fitness/nutrition programs, among holistic recommendations to harmonize the soul. I believe in working on all 3 levels as they are inter-related: Mind, Body, Soul. I told someone the other day that I was vegan, she looked me up and down and said, "But you look so healthy?" People think we are weak and scrawny and unhealthy. How do I address this? I run laps around them at the gym and lift heavier weights than they do. I think they get my point across better than if I were to simply describe how amazing I feel. I'm nourishing my mind and my body with every meal. Let food be thy medicine and not they poison. My personal strengths are my endurance and my quick recovery. I have moments when I find it challenging to be in involved in the fitness industry, people are always trying to conform me to their idea of normal and passing judgement on how I choose to live my life. If I catch a cold, everyone assumes it because I'm vegan, and it can be exhausting to feel like I need to defend veganism all the time. I also find it challenging to get certain perks in industry, when most athletes earn their pro cards they receive sponsorships, there isn’t many companies yet that are vegan friendly. The majority of them are not supportive. Though some are constantly telling me what I am doing wrong. 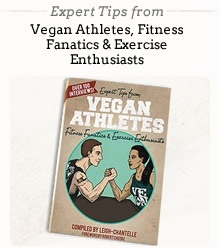 In their opinion, it’s that I’m not eating meat or indulging in whey proteins and countless eggs. Yes they are. They have been trying vegan and raw restaurants even when I'm not around now which I love. The protein requirement in a healthy adult is simply the amount to replace obligatory losses. Basically, the only way to be protein deficient is to be calorie deficient. In fact, the more calories you consume from raw foods such as fresh fruits, vegetables, sprouts, etc, the less extra protein we require. Our body is an amazing recycling machine, and is able to turn over 100-300 grams of our own protein every day. Consuming 10% of our daily caloric intake from protein is sufficient. The RDA is 0.8 grams per kg of body weight. Last year when I competed for the first time and won my pro card there were only 2 vegans on the stage. This year I am training 8 girls so far that will be competing as raw vegans and they all tell me that their former trainers told them they had to eat meat or they wouldn’t do well. We will show them this isn’t the case, as now they are going to rawk the stage, they look great and they feel even better. I'm able through example to be able to show competitors another avenue and create awareness and hopefully stop the slaughter of innocent animals. Lunch - Huge salad with hemp/chia seeds, tahini based dressing. Snacks (healthy & not-so healthy) - Lots and lots of fruit, yum! What is your top tip for Gaining muscle, Losing weight, Maintaining weight, Improving metabolism and Toning up? My tips are the same for all: eat clean, train hard, be consistent and have fun. When it comes to losing weight or gaining muscle, it’s about portion sizes and keeping the workouts consistent and intense. I’m a wellness author, I wrote 12 weeks to Raw-some: Diva Edition It’s about veganism and consists of a 12 weeks plan to optimize your health: mind, body and soul, and manifest your desires in reality. I also post recipes, photos, quotes on Facebook, Twitter and blog on my websiteeveryday. I’m also an active member of PETA. If you're looking to transition to veganism or raw veganism, have an interest in fitness, chakras, vegan beauty tips and products, meditation, etc my book 12 weeks to Raw-some: Diva Edition is an excellent guide. If you have additional question contact me through my website where you can find the link to PETA as well, It’s super easy to sign up and start saving lives.